Supplies long-chain ω-3 fatty acids, eicosapentaenoic acid (EPA) and docosahexaenoic acid (DHA). 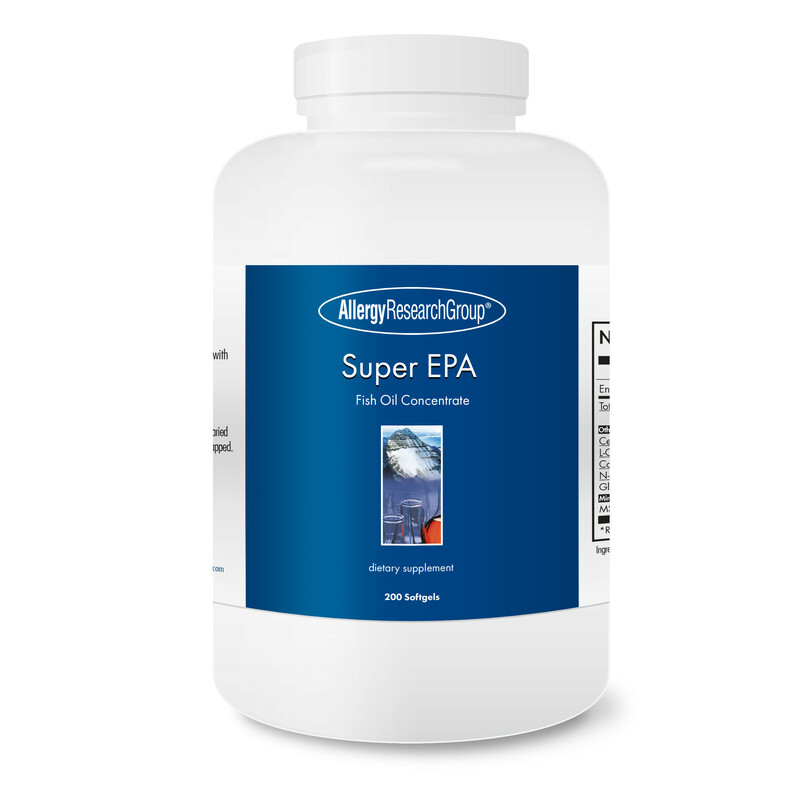 Super EPA is prepared from fish oil from cold water fish such as sardines, anchovies and mackerel. Each batch is molecularly distilled and tested to insure purity and the absence of heavy metals and other contaminants. Super EPA contains a useful source of EPA and DHA. Eicosapentaenoic acid (EPA) is a rich source of long-chain omega-3 fatty acids and is present in high quantities in cold water fish. Oils prepared from such fish as sardines, anchovies and mackerel are also rich in docosahexaenoic acid (DHA), an omega-3 fatty acid. Both of these fatty acids are important for maintaining the fluidity and function of cell membranes, particularly in the retina and the brain. Super EPA is prepared from molecularly distilled fish oils. Each batch is tested to insure purity and the absence of heavy metals and other contaminants. Why take fish oil supplements? May support the cardiovascular, musculoskeletal, gastrointestinal and immune systems. Fish oils have been shown to support cardiovascular function. EPA and DHA can inhibit lipogenesis and stimulate fatty acid oxidation in the liver, which both play a role in the body’s regulation of triglycerides. EPA and DHA may also help maintain healthy blood flow through their involvement with the body’s process of regulating fibrinogen levels and platelet adhesion. EPA and DHA are also thought to support the proper beating of the heart. EPA and DHA are known to support the brain, and the musculoskeletal and gastrointestinal systems. DHA is essential for normal foetal and infant brain development, and supports normal brain function throughout life. DHA supports normal cognition and mood, through its support of membrane fluidity in brain cells. EPA and especially DHA are found in the membrane phospholipids of cells in the cell-signalling pathways, where they appear to dampen signal transduction associated with arachidonic acid and certain phospholipids. Consume whole, fresh foods, and minimise all forms of refined food, sugar and carbohydrates. Drink plenty of fresh water. Chew food well, and relax when eating. Take regular gentle to moderate exercise. Stop taking before any surgical procedure. If you are haemophiliac or take warfarin, consult your physician before using. Manufactured by Allergy Research Group. As a food supplement, 2 softgels daily with meals. Ingredients: Fish Oil, Gelatine, Glycerine, Purified Water, D-Alpha Tocopherols.